Are you using a lot of water to irrigate office park landscapes? If so, what's the big deal? Water is cheap. A nice landscape draws tenants. Why mess with a good thing? It turns out that there are a number of ways to reduce water use for irrigation of office building landscapes that are highly cost-effective while producing first-rate landscapes. What's more, the cost of municipal water is rising faster than other utilities and faster than rents, making a focus on water efficiency a prudent option. Commercial and residential landscape irrigation eats up 50 percent of the municipal water supply in the big cities of Texas, according to the Dallas Water Utilities, and this is not unusual in the U.S. The Massachusetts Water Resources Authority reports that, during summer months, water demand increases up to 50 percent. The lion's share of this increased demand feeds irrigation systems. Municipal water systems have spent several years encouraging reductions in indoor water use. Outdoor water use (primarily irrigation) is now getting more attention, as indoor use reductions have taken hold. Water fees vary quite a bit around the country (See chart below). Water and sewer fees are tied together in some municipalities, where one fee covers both, and separated in other water systems. 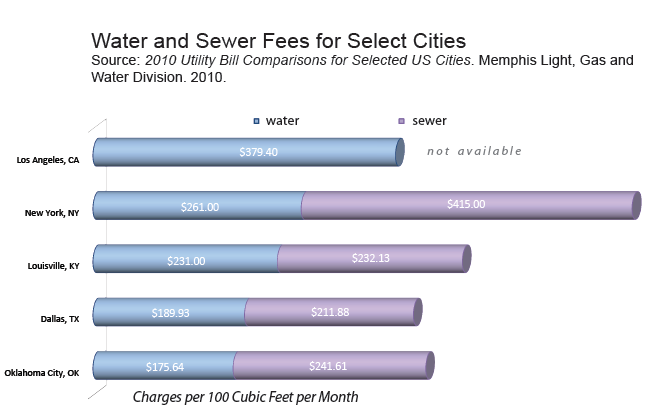 Fees range from a low of around $1 per hundred cubic feet (HCF) in Alabama, to a high of over $12 per HCF for combined water and sewer fees in Austin, Texas. Nationally, water fees have risen between 4 and 8 percent per year, over the last 10 years, with plenty of signs pointing toward similar price escalation for the foreseeable future. According to the Pacific Institute's recent article "Water-use Efficiency and Productivity," the average office building in California puts approximately 35 percent of its total water use into landscape irrigation. With water rates that range from $3.50 to $4.00 per HCF, this can be up to $26,000 annually for a 100,000-square-foot building, based on average usage. This may not sound like much, relative to other utility costs, but the investments necessary to reduce water use are small and the paybacks are short. There are three basic methods of reducing irrigation water use in commercial office parks. The first method is to change the landscaping to low-water or no-water plantings. The second method is to install "smart" irrigation systems that irrigate only when necessary, using an optimized amount of water. The third method is to collect rainwater for use in irrigation. A simple cost-saving strategy that does not affect water use in municipalities with separate water and sewer fees (most municipalities) is to meter irrigation or sewer outflow water separately from indoor water, so that sewer charges are not paid on water used outside the building. Las Vegas has led the way in programs to reduce outdoor water use with low-water landscapes. The city has special pricing for irrigation water use, and a rebate program to encourage the elimination of turf and other high-water-use landscape plants. Las Vegas has shown the value to building owners of reducing water demand in the landscape. Turf grass requires an average of 40 to 60 inches of water per year. Subtract annual rainfall and factor in the amount of that rain that runs off, and the annual irrigation need is 20 to 50 inches per year. An office building with 1,000 square feet of lawn would need between 12,000 and 25,000 gallons per year just to keep the lawn green. The traditional low-water landscape limits the amount of lawn and substitutes shrubs, groundcover plants, and non-turf grasses with much lower water needs. A typical low-water landscape can use just 25 percent of the water used by a similar lawn area. While it may not be advisable to surround a wonderful building with cacti, some simple low-water planting strategies for strategic parts of the office landscape can greatly reduce irrigation water needs.